Perched precariously on a remote hilltop, protected by huge canyons and fierce rivers either side, lies the lost Inca city of Choqeuquirao. 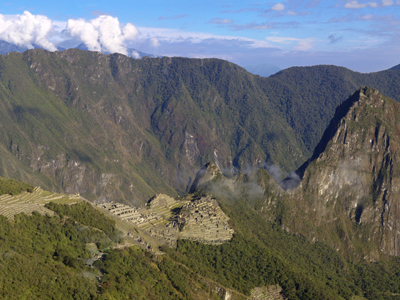 This adventurous trek takes you in the footsteps of Hiram Bingham and connects the three fantastic Inca sites he discovered over 100 years ago. Supported by mules you follow old Inca trails to traverse the entire Vilcabamba mountain range from the Apurimac to Urubamba river connecting the stunning sites of Choquequirao, Llactapata and Machu Picchu. From arid canyons and high mountain passes, to the warm moist air of the jungle this 40 mile journey is one of the most spectacular and diverse treks in the whole of the Americas. Welcome to Cusco! Upon arrival, collect your luggage and meet your guide, then drive twenty minutes through the colorful South American streets to your hotel. After you have checked in and freshened up, meet in the Coffee Museum at 1:00 PM to enjoy a tasty lunch and learn about the story and people behind this popular drink. Visit the Plaza de Armas, the Cathedral and the Qoricancha temple of the sun and perhaps take in the sights, sounds and smells of San Pedro food market too. If you normally shop in supermarkets and farmers markets, you are in for a surprise. Stands full of juicy exotic fruits, counters heaving with cow heads and sheep hooves and cheerful local women selling handmade cheeses, local breads, healthy juices and even toad soup. The evening is free to relax and wander around the UNESCO World Heritage Site city center. 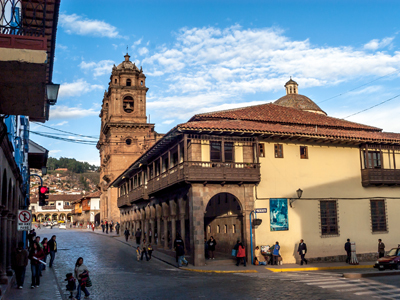 Cusco is filled with well preserved colonial architecture, evidence of a rich and complex history. The city itself represents the center of indigenous Quechua culture in the Andes, and by merely walking the streets one sees the layers of history. Spanish colonial buildings erected directly atop Inca walls line the square, while the modern tourist nightlife flourishes in their midst. Nowadays, Cusco is known for its indigenous population--often seen on the streets in traditional clothing--and its substantial tourist-fueled night life. Leave Cusco behind today, as you embark on a drive along good tarmac road, until turning off to the beautiful village of Cachora. 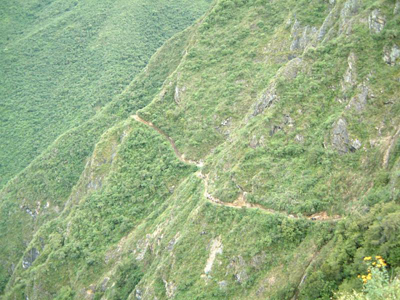 Your trekking team will be waiting for you near the trail head, to begin your Choquequirao Trek Adventure! 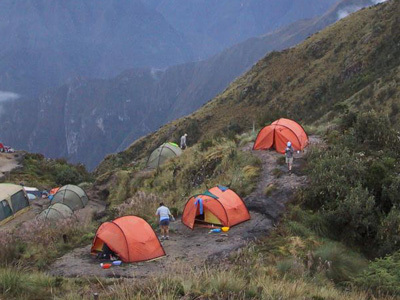 After an early lunch, you will start to descend the switchback trail, 1600m (5250ft) into the Apurimac canyon and the small settlement of Chikiska, where you will set up camp for your first evening under the stars. After a hearty breakfast, you will continue this morning down to cross the roaring Apurimac river. This route will take you climbing past the small communities of Santa Rosa and Maranpata, onward to your camp next to the Choquequirao ruins. The path is clear, although quite steep and it can get very hot. This will be a long and tough day, requiring an early start, but the scenery more than makes up for the hardships endured! 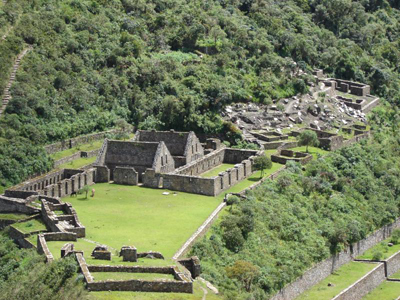 A brief 15 minute walk, will take you to the main square of the amazing Choquequirao ruins. Perched on a tiny hilltop 1,700m (5580ft) above the Apurimac, this setting and panoramic views before you are simply indescribable. 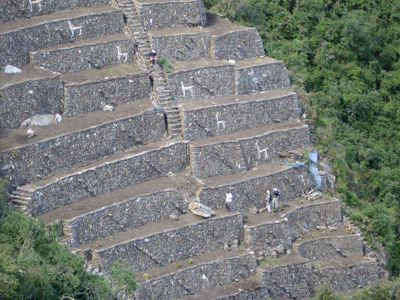 These impressive ruins cover an area far bigger than even Machu Picchu! 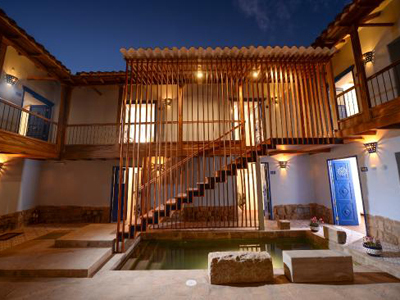 Enormous curving terraces, ritual baths and a gorgeous main plaza, are just some of the highlights. For those of your that still have the energy, you can even descend farther, to see the famous white stone llamas laid into the rock. 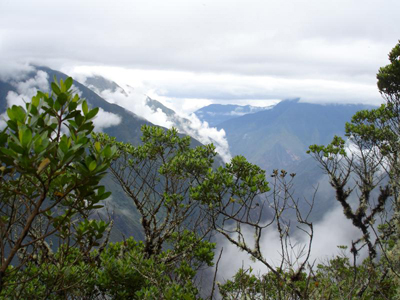 Choquequirao remains a true Peruvian mystery. It was not mentioned in the Spanish chronicles and although Hiram Bingham visited it before Machu Picchu, he failed to realize its importance. Large areas still remain covered in the thick cloud forest, giving you a literal Indiana Jones experience. Even today, it receives very few visitors, protected by its remote location. After an incredible day exploring, you will return to your base camp to relax and ponder upon all that you have learned and seen today. You will head out on your hike early this morning, for the short climb to the pass. From there, it is downhill 1400m (4600ft) past the recently discovered ruins of Pincha Unuyoc, all the way to the Rio Blanco, where you can dip your feet in the cool waters. Just beware of the biting sand-flies! Known as “Pumahuacachi”, their fitting name means, “makes the puma cry”. Refreshed and cooled off, you will continue climbing steeply again, 1,200m (3900ft). This part of the journey will take you to the small and beautifully located campsite of Maizal, at an altitude of 3,000m (9840ft). This is probably the toughest day of the trip, but if you are well prepared and determined, you will succeed! And don't worry, we promise the cold beer on arrival will taste even better! Pack up camp again this morning, and climb past the old silver mines, up to the highest pass of the trip. Abra San Juan at 4,000m (13123ft), affords spectacular views of the Cordillera Vilcabamba mountain range. 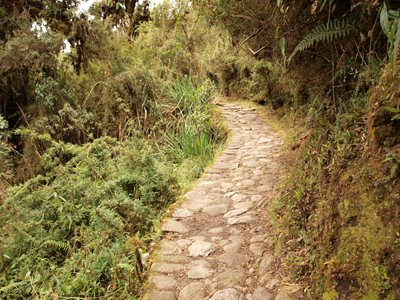 You will then proceed, taking a delightful, and at times, precipitous path down to the charming Andean village of Yanama. Here, you will say goodbye to your trusty arrieros, and new friends, as you climb aboard the waiting vehicle. Your transfer will at last give your feet a rest, on a spectacular drive along a brand new road, that takes you over the Totora pass and down to the small hamlet of Lucmabamba. You have made it to your final day of hiking! Today, you will head off on the spectacular royal Inca trail, up through lush coffee and tropical fruit plantations, and into pristine cloud forest. As the path crests the ridge, old Inca walls appear out of the forest and you will step into the recently cleared ruins of Llactapata. Hiram Bingham made it here too, but the map he drew was so bad, neither he nor anyone else could find the ruins again for 80 years! In the mid 1990’s an Anglo-American team found them once more, totally covered over by thick jungle vines. Step a few meters further, and you will see just why the Incas built here. The view across to Machu Picchu is purely magnificent. Very few tourists have ever had the opportunity to admire the ancient citadel from this side and perspective. After some time to sit, contemplate the view and watch the Andean Swifts playing overhead, you will descend steeply to the Urubamba valley and the hydroelectric plant train station. From there, you will have the option to either wait for the short, but spectacular train ride, or hike two to three hours along the rail-track, to the bustling town of Machu Picchu Pueblo and your hotel for the night. 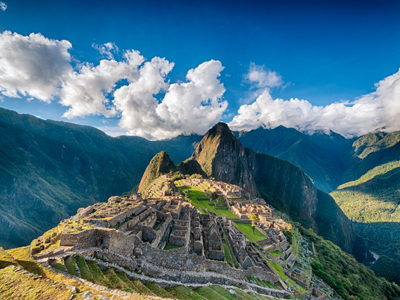 Today you explore the pinnacle of Inca engineering - Machu Picchu. For years it was lost to the jungle. Rediscovered in 1911 by the Yale professor Hiram Bingham, declared a UNESCO World Heritage Site in 1983 and one of the New Seven Wonders of the World in 2007, Machu Picchu exceeds all expectations. This astounding site lies in an even more astonishing location. Perched high on an inaccessible hilltop it is protected by huge cliffs and the raging Urubamba river. Things are slightly easier now than in the time of the Incas and so you start your day with a twenty-minute bus ride up to the site. Enjoy the day at leisure resting after your challenging trek and soaking up all the wonders of the Andes. Consider a later departing outbound flight to enjoy the charms of Cusco prior to your departure. Today, you will be picked up at your hotel and transferred to the airport for your departing flight.